The new logo of the Okinawa Prefectural Bullfighting Federation, the Okinawa Ken Togyu Rengokai. 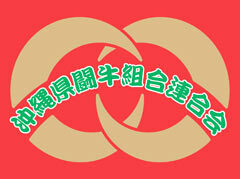 The Okinawa Prefectural Bullfighting Federation (Chairman Masakazu Kochi) recently decided upon a logo. In a competition organized by the Federation and the Ryukyu Shimpo, a logo designed by 35 year-old company employee and resident of Nakagusuku Village Tomokazu Yasuda was selected from among the total of 53 works put forward by members of the public for consideration. The award ceremony will be carried out at the All Okinawa Togyu (Bullfighting) Autumn Tournament, scheduled to be held on November 13 at Ishikawa Municipal Multipurpose Dome in Uruma City.